If you have automatic updates configured you’ll see the update in your dashboard soon. You can also download the zip file and manually install the update. 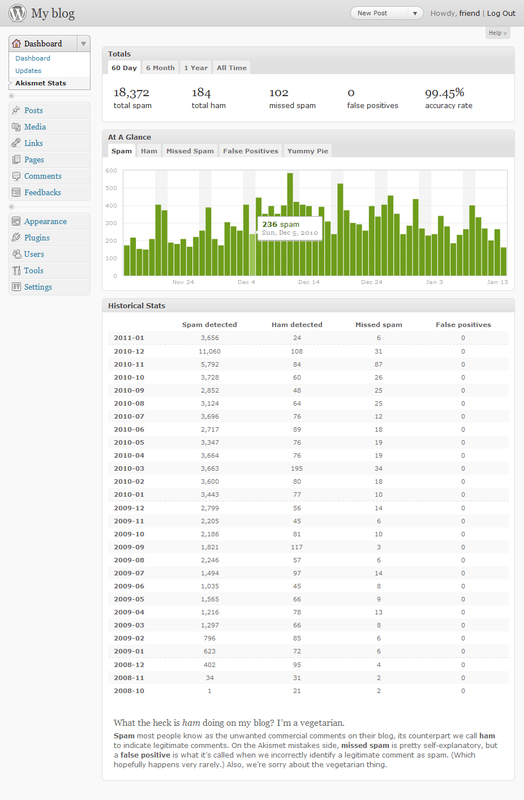 We’ve redesigned the Akismet stats page to bring it in line visually with the rest of the WordPress admin. There are new view options: the last two months, the last six months, the last year, or all time. Not only does the page look better, it also loads faster thanks to flot.js. Flot is a great little open source chart library for jQuery. Flot give us complete flexibility over how we display stats, and it allows you to view stats on any device that supports JS. On Jan 17th at 20:52 UTC there was a network outage that caused the Akismet.com DNS servers to be unavailable for 12 minutes. The problem has since been fixed, and everything is back to normal now. This means that for some blogs, there was a brief window where the Akismet API servers were unavailable. If you’re running version 2.5 or later of the Akismet plugin, any spam or comments during that window were held in the moderation queue, then re-checked a few minutes later. We apologise for the inconvenience. If you’re running WordPress 3.0+ and haven’t already upgraded to version 2.5 of the Akismet plugin, we’d like to remind you to update, since the new plugin includes features specifically designed to recover from a situation where your blog can’t reach the Akismet API servers. If you’re ever in doubt, you can see independent third-party availability monitoring of the Akismet API servers here.